Fall is an ideal time to crack open a book, and there are plenty of choices out there to stimulate a public relations professional’s appetite for ideas and inspiration. Take time out from catching the latest viral video (we like this one) or binge-watching an addictive show like “Narcos” and pick up a book that will let you explore something in depth. The options are endless – from self-help to examinations of real-life events with the media front and center, to pure fiction. 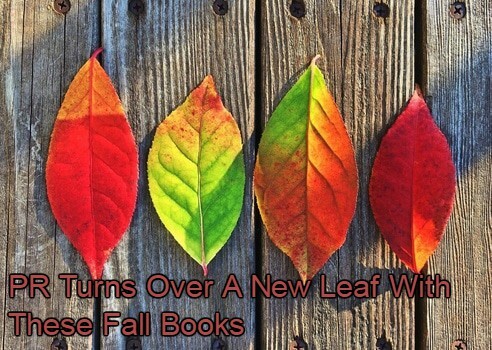 In the past, we’ve suggested books we found appealing to PR and marketing types, and here are some more fall recommendations that are sure to provoke new thoughts. Write like a “Boss.” The Boss, to be more specific. Bruce Springsteen’s memoir, Born to Run, has been met with effusive praise, and with good reason. There’s an undeniable link between his storytelling chops and his famously evocative song lyrics. As we always say, the best way to improve your own writing is to read a variety of others. It’s no coincidence that superlative songsmiths are getting their due this fall, as Bob Dylan demonstrated earlier this week, winning the Nobel Prize for literature. When media meets politics. With Election Day just around the corner, what better way to get into the spirit by reading one of the most celebrated books ever written about politics? All The President’s Men follows two Washington Post reporters – Carl Bernstein and Bob Woodward – who delve into one of the deepest investigations in American history to expose Richard Nixon and the Watergate scandal. This masterpiece of the journalistic process includes many themes and ideas that can be applied to public relations, including “on-the-record vs. off” media rules, how to handle crisis situations, and proof that hard work and persistence pay off in the end. Hustle and flow…and grow? What would fall be without a dynamic business tome or two to help PR people find their passion and prosper? This season has seen the publication of Hustle by Neil Patel, Patrick Vlaskovits, and Jonas Koffler―three of the nation’s top entrepreneurs and consultants―teaming to teach us that the secret to career happiness lies in making manageable tweaks and placing small bets on pursuits that propel you from who you are today to the person you’re destined to become. Hustle shows us to look at work and life through a new lens―one based on discovering projects you enjoy and the people and opportunities that support your talents, growth, income, and happiness. For pure relaxation. Your most demanding assignment is finally finished. You survived the stress of a new business presentation and deserve some excellent escapist fiction to take you away. For many, nothing does the job better than crime fiction. And one of the best is out with a new whodunit that we promise you won’t be able to put down, even when CNN issues a new presidential poll. The book is The Trespasser by Irish novelist Tana French. French always imbues her thrillers with something dark, and the results are compelling. For a great example of how an obsession can lead to unchecked online chat and ultimate disaster, also read French’s Broken Harbor. Funny, insightful takes on pop culture. Want an edge when coming up with creative ideas for consumer PR campaigns? It helps to know what’s in and what’s out and who made the cover of People Magazine last week. To help you stay on top of your pop stars and your movie stars, we offer up The Must List by the editors of Entertainment Weekly, who you can trust to have their fingers on the relevant and the not so. Remember, it’s often said that the best PR people have an encyclopedic knowledge of all things pop culture!